Background: MRE is capable to measure the full 3D displacement field of externally induced waves inside living organs and tissues. Viscoelastic constants are then reconstructed in order to detect pathological alterations. Problems and perspectives: In classical MRE, spatial maps of viscoelastic parameters lack consistency. These so-called elastograms are regularly limited by severe artifacts due to wave nodes or low amplitudes, resulting in unreliable regions where no elastic deformation can be achieved. Such uncertain regions have to be identified and masked to avoid biased stiffness estimates. We therefore developed multifrequency inversion capable to compensate ill-posed regions of the wave equation by solving an over-determined set of equations . Furthermore, the complex microstructure of soft tissue leads to directional dependence of viscoelastic properties, as e.g. in case of fibrous tissues. The resulting elastic anisotropy leads to coupled dynamics of shear and pressure waves that has to be accounted for in order to recover stable and hence meaningful direction dependent parameters. In muscle tissue the dynamics can be decoupled by measuring the displacement field in an image plane which coincides with a plane of muscle symmetry [2,3]. However, in less ordered tissues, this approach is not feasible. A current project is devoted to the development of novel methods for analyzing the anisotropy of elasticity in soft tissue . Figure 1: Multifrequency MRE of the liver. a: wave images acquired at vibration frequencies from 30 to 60 Hz. b: Standard single-frequency inversion showing severe artifacts due to inversion-related uncertainties. c: Multifrequency inversion yields much fewer artifacts and thus outperforms all classical approaches based on single-frequency parameter recovery. 1. 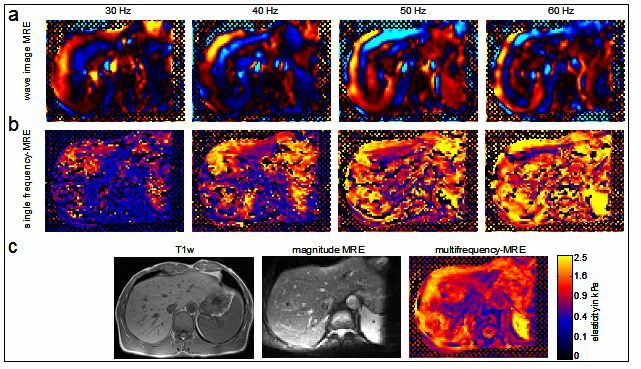 Papazoglou S, Hirsch S, Braun J, Sack I. Multifrequency inversion in magnetic resonance elastography. Phys Med Biol 2012;57(8):2329-2346. 2. Papazoglou S, Braun J, Hamhaber U, Sack I. Two-dimensional waveform analysis in MR elastography of skeletal muscles. Phys Med Biol 2005;50(6):1313-1325. 3. Papazoglou S, Rump J, Braun J, Sack I. Shear-wave group-velocity inversion in MR elastography of human skeletal muscle. Magn Reson Med 2006;56(3):489-497. 4. Romano A, Scheel M, Hirsch S, Braun J, Sack I. In vivo waveguide elastography of white matter tracts in the human brain. Magn Reson Med 2012;68(5):1410-1422.